Rue's Kitchen began as a single page on a group website now long lost to the mists of time. I can hardly believe it has been 20 years! In honor of this anniversary, my site is undergoing a long-awaited makeover. Rest assured that all the previous content is still here. 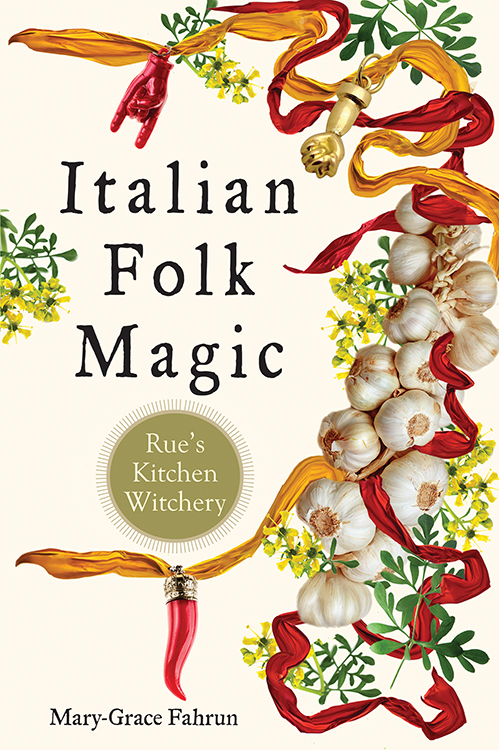 I am very excited to announce that my book, Italian Folk Magic: Rue's Kitchen Witchery, is available at all fine booksellers! Personalized signed copies are always available here! "The kitchen, my kitchen, is the room where nourishing meals are prepared. It is where afternoon coffee is brewed and stories shared. When someone doesn't feel well, it is where chicken soup simmers and herbal teas for any ailment are brewed. Stored in the cupboards are dishes and cups, some of which once graced my mother's kitchen. It is where my herbs, spices, and oils are stored. It is the room where old friends sit and enjoy a cookie with freshly brewed espresso and share their joys and sorrows. It's where I go to pray. I meditate while I clean and pray while I cook. It is the room where most of my memories live. It is my temple, shrine, and altar." The book contains magical and religious rituals and prayers and explores divination techniques, crafting, blessing rituals, witchcraft, and, of course, the evil eye, known as malocchio in Italian―the author explains what it is, where it comes from, and, crucially, how to get rid of it.